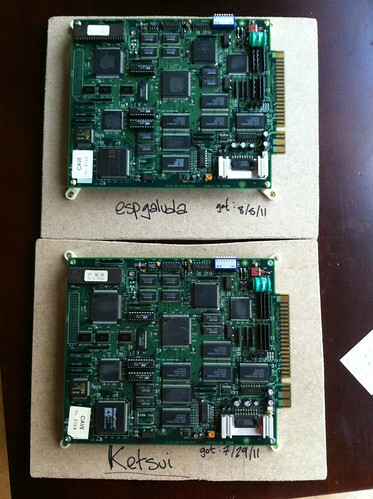 They look similar since they both run on the PGM hardware platform. I already own the Ketsui 360 port but I wanted the real deal since it’s my favorite shmup. After getting the PCB I started playing quite a bit and I got SO close to pulling off a 1-ALL on the PCB, I had the stage 5 boss down to about 4 pixels of health when I sadly got blowed up. One day I will be victorious… hopefully. I picked up Espgaluda since I used to play it at the now-defunct Pink Gorilla arcade and always really liked it. It’s not as punishing as Ketsui which makes it a nice change of pace, however in the week that I’ve had it I already 1CC’d it. My score was quite low. I think I said in a prior post that I need to “chill” when it comes to buying more games. Well at this point I’m pretty content with what I’ve got, so now I probably will actually chill.